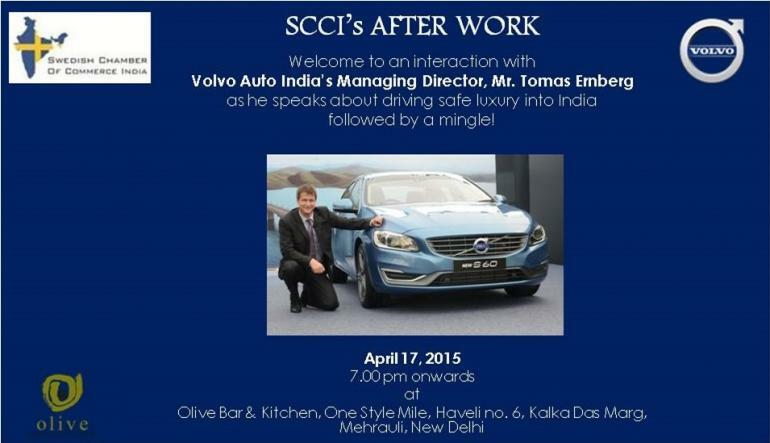 Welcome to an interaction with Volvo Auto India's Managing Director, Mr. Tomas Ernberg as he speaks about driving safe luxury into India followed by a mingle. Tomas Ernberg, Managing Director, Volvo Auto India Pvt. Ltd, since 2011, holds the responsibility of overall planning and operations for the company. Tomas' diverse experience in the automotive industry and Volvo Cars, has endowed him with deep insights and expertise on the sector. A Volvo veteran, having spent over 20-years with the company, Tomas embarked upon his journey with Volvo in 1994 as the Tourist and Diplomat Sales Manager at Volvo Cars, Turkey. He later moved on to work in several management positions including Network, Marketing and Sales. In March 2008, Tomas assumed the role of Regional Managing Director, based in Dubai. He managed 13 markets in the Middle East and North Africa there. Take the opportunity to mingle, network and interact with friends and guests in an informal and relaxed environment.